In this article you will find in-depth information about PMP exam report, historical passing score & percentage, current passing criteria & grading system. 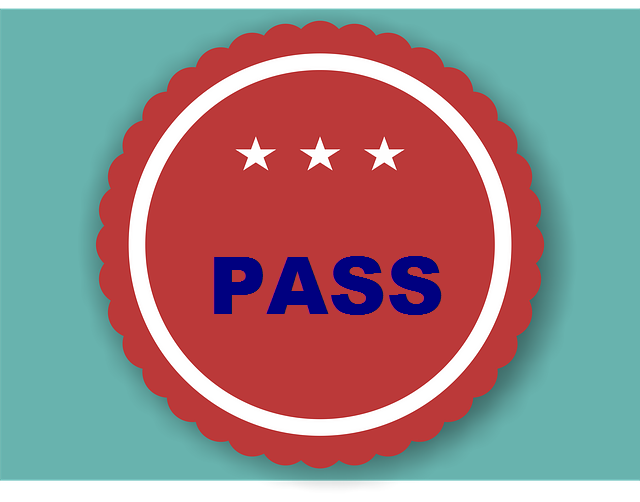 Do you know what the PMP passing score is? 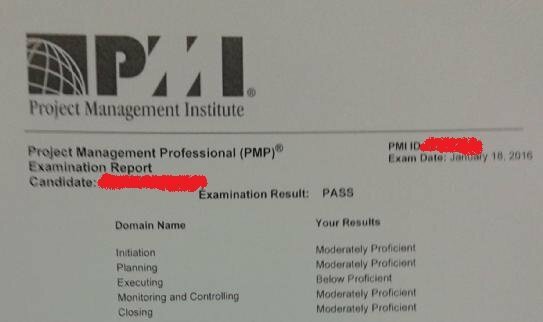 No one knows what the PMP Passing Score is. Yes! That’s true. No one really knows about the passing score for the PMP certification exam. OK! The above statement may not be entirely true. PMI folks might know what the PMP passing percentage or score is. Or they might not! There may not be a definite score for passing or failing in the PMP test. For a very long time, PMI has kept the passing criterion of credential exams under wraps. They have given out little information. There are several opinions, many inferences, plentiful rumors and some lies regarding the PMP test passing criteria. But no one, except for PMI, knows what the PMP passing criterion is. In the Internet chatter, you might find people claiming 61% (or 62%) to be the passing score. But this is just a popular opinion – it has little relevance. I passed my Exam in the year 2005. In those days, there was a definite passing percentage – it was 68.5%. The PMP aspirants were required to mark 137 questions correctly out of possible 200 (175 regular questions and 25 pilot questions) to get the coveted PMP certification. 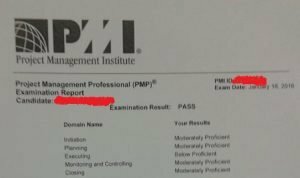 Shortly after I completed my certification, PMI changed the passing percentage to 60.6% (106 correct questions out of 175 regular questions). In the year 2006, PMI stopped publishing the passing score. The last published passing score was 60.6%. In the year 2007, PMI changed the test passing criterion. Since then, the passing criterion is little obscure. The exam score report does not contain percentage of correct or incorrect questions. It contains something equivalent to grades. These grades were called proficiency levels. The candidates were given one of the three proficiency levels viz. proficient, moderately proficient, and below proficient on each of the five tested domains. Refer to the next section for more details about the grading system. Facts I – III are historical facts. They have very little relevance today. Let’s us understand the current scenario. PMI yet again changed the changed the grading system in the year 2017. The prevailing system was launched on August 28, 2018. Instead of proficiency levels, the score report now contains four performance rating categories viz. above target, target, below target, needs improvement. There is little clarity on how grading was done historically or how it is done today. But we know for sure that you can pass the exam even if you score ‘Below Target’ in one of the domains. I have seen many people who got below target in one of the domains but still passed the exam. You can also look at an historical example. Refer to the PMP Exam Score report below. One of my Linkedin Acquaintances shared his report with me. You would notice that this person got ‘Below Proficient’ in one of the domains but still passed the exam. PMI tests candidates’ knowledge for five different domains viz. Initiating, Planning, Executing, Monitoring & Controlling, and Closing. You can refer to my article on PMP Exam Changes in January 2016 for details about these 5 domains. Since 2007, PMI has been grading the candidates on each of these 5 domains. Upon completion of the computer-based examination, each candidate receives a printed copy of the test results. In addition to the overall pass/fail status, the exam report contains candidate’s performance grade for each domain. The grades are provided to both passing and failing candidates. These were assigned based on the number of questions answered correctly within the domain. It provides a direction about candidates’ strengths and weaknesses. A pass/fail result that is generated based on the overall performance of the candidate. A performance grade for each of the five tested domains. You can download a sample exam report and results analysis page from PMI’s website. The PMP exam score report used to grade the candidate on a 3 point scale called proficiency levels. Each topic domain was assigned one of three levels of proficiency — Proficient, Moderately Proficient and Below Proficient. Proficient – indicates performance is above the average level of knowledge in this chapter. Moderately Proficient – indicates performance that is at the average level of knowledge in this chapter. Below Proficient – indicates performance is below the average level of knowledge in this chapter. The PMP exam results report currently grades the candidate on a 4 point scale called performance rating categories. Each topic domain is assigned one of four performance ratings — above target, target, below target, needs improvement. Here is an excerpt from PMI’s website. Above Target: Performance exceeds minimum requirements. Target: Performance meets minimum requirements. Below Target: Performance slightly below target and fails to meet minimum requirements. Additional preparation is recommended before re-examination. Needs Improvement: Performance is well-below target and fails to meet minimum requirements. Additional preparation is strongly recommended before re-examination. PMI has provided little detail on how the grading system works or how the proficiency levels are given. PMI’s grading system is open to conjecture and inferences. We don’t know what combination of performance grades is good for passing the exam. As a PMP aspirant, you have to prepare well. You should not get swayed by the popular opinions. Now the pertinent question would be – if there is no passing score how would you know if you have prepared well for the exam? You will find answer to this question in the part II of this article – Best Way to Determine PMP Exam Passing Score. Please share your opinion about the exam scoring process in the comments below. I would also request the certified PMPs to share their results. It will help the future aspirants. If you do not want to share publicly, you can contact me directly – I will share the results anonymously. Great Information Sir! I have browsed through a lot of articles recently but your’s have some unique and unknown facts. Thanks for sharing this with us! Spot up with this write-up. So many websites have given confusing statements. good one sir, let me know the precautions to take PMI examination. I have a plan to do so. Hi Raja, You can refer to this article – http://www.pmbypm.com/reasons-why-people-failed-the-pmp-exam-how-to-pass-pmp-exam/ Good luck. Thank God. I saw you post. I always believed 61% is passing score. I might have failed the test. 137 out of 175 correct is 78%, not 68.5%. Hi jforman, I believe you are referring to “Fact I” in the article. Kindly read it again. It says “137 questions correctly out of possible 200”. Hope it helps. Great beat ! I wish to appreciate. At the same time most web site say 62%. There may not be a set score. I write exams for a well known certification exam and the passing score depends on the difficulty of questions on your exam. Since there is a random test generator the exam difficulty varies so each question is weighted. Sometimes they want a certain percentage to pass/fail. This exam is targeted to around 70% passing score 70% people passing but I believe the actual numbers are a little lower. This may correlate to PMI as well, a lot of it as to do with ISO certification. As per my understanding and calculations, the passing % must be between 62-65%. But every student suppose to prepare to be on safer side to score minimum 85% in mock test so in actual exam the reserve of 20% (=85%-65%) may help for tough question. Hi Anand, Would be good to know if PMI has mentioned 62-65% somewhere. Or is it just your belief?